A platoon of Montford Point Marine recruits stand at parade rest in 1943 at New River, NC. The Montford Point Marines fought to be assigned to infantry units and eventually won the right, taking part in some of our nation's greatest battles. While the Army and Marines retained their bans, the Navy accepted a limited number of black enlistees after 1798 because of the need of men who could endure the harsh conditions of life at sea. Through time, free blacks fought with them in the War of 1812, the Battle of New Orleans, the Indian War, and the Spanish-American War, with the US Colored Troops serving in the Civil War in 1862. During the First World War, 367,000 African Americans served in segregated units, though the Marine Corps remained a white enclave, as they refused to enlist blacks. It was becoming increasingly difficult for African Americans who wished to give their service to their country to do so. Finally on June 25th 1941, President Franklin D. Roosevelt signed executive order 8802, allowing the continuation of racial segregation, but banning firms receiving government contracts or government agencies from discriminating the employment of workers because of race, creed, color, or national origin. To enforce this order, the Fair Employment Practices Commission was created. Though the Marine Corps was unhappy with this order, they had no choice but to abandon their racial discrimination policies, at least in part. The Corps decided to send blacks to an east training center at Parris Island. In late 1941, the Marine Corps acquired the Marine Barracks New River in North Carolina. The new base near Jacksonville in Onslow County was eventually called Camp Lejeune. In April of 1942, the Corps started construction on its segregated training facility, which was given the name Montford Point. The facility was located on a small peninsula in the New River, but unlike the rest of Camp Lejeune, did not offer the miles of usable beaches for amphibious training exercises. In August, the segregated training facility was opened. This part of the camp was a swampy, wildlife-ridden forest area. The area's animals and insects varied from absurd amounts of mosquitos and deer flies, to bears and snakes. The flat plain was interlaced with brackish creeks, along with rapidly growing shrubs and poison ivy. Formidable climates made for harsh tests of physical and mental endurance, with the summer temperature often peaking above 100 degrees, and the winter weather occasionally dropping below 10 degrees. The first Recruits who arrived began training before construction was even completed. They were assigned tent-like structures before concrete block barracks were built. Slowly, other administrative and service buildings were built around the drill field and parade ground, including a chapel, mess halls, and a theater. The Marine Corps chose a career officer from South Carolina, Colonel Samuel A. Woods, as the first Montford Point commander. Woods chose an experienced, all-white staff of officers, non-commissioned officers, and drill instructors. All were veterans of service in places like the Philippines, the Caribbean, and Nicaragua, so it was reasoned they had experience with "colored troops." The Corps assigned Woods and his staff to quickly identify which black recruits had leadership potential to replace the original white drill instructors. This was accomplished by late 1943 with the idea that "at no time was a black man to give orders to a white Marine." Although 75% of the 17,000 new Recruits from 1942-1944 had some college education, none became officers. Though these black recruits were met with racial prejudice and open hostility, they were expected to receive "equal training" as the others at Parris Island. Boot camp demanded constant activity, from learning Marine Corps discipline to mastering the use of hand-to-hand combat, rifles, and bayonets. Though kept very busy, the Recruits found time for playing cards, conversation, cigarettes, sports, and occasionally sharing mail from home, which formed a tight bond between them. This close camaraderie was incredible in its formation, helping balance the extreme prejudice, vigorous training, and frequently harsh environments that they faced. The Marine Corps training facility was built at the North Carolina location because of efficiency and cost, without the thought of the struggles the African Americans would experience in that area of the country. As Recruits were coming to Montford Point to begin serving their country, millions of African Americans were fleeing the region to attempt to escape the strict segregation. As the most impoverished part of the country, the South's citizens were heading to other parts of the United States, hoping to find the opportunities of better economics, social freedom, and exercising their right to vote. In a region that clung to near-total disenfranchisement and violence as a means to keep people in subservient positions, African Americans relocated to embrace the opportunities of a nation at war that assured a better life for their families and themselves. Though the presence of black drill instructors and the career aspirations of those at camp helped to temper racial prejudice somewhat within Montford Point, the situation out in the community was very different. The men of Montford Point faced extreme racism of all forms while in Onslow County, from having to sit in segregated, and less comfortable, seating on buses and trains and in theaters, to being required by police to stay out of "white areas" of surrounding communities or being asked to leave certain establishments. The Montford Point Marines took part in three major wars and several smaller conflicts while dealing with such discrimination within the Corps and out in the world. During World War II, two-thirds of the African Americans who served in the Marine Corps served overseas. The 6,430 African American Marines who were stateside included members of units assigned to naval supply depots at McAlester, Oklahoma, as well as at Philadelphia, Norfolk, and five other Marine depot companies. Overseas assignments were not meant to place Montford Point Marines in combat, as they were seen as not fit to take part. Instead, they were assigned to duty stations outside combat zones in the Pacific. Two combat units from Montford Point were created, the 51st and 52nd Defense Battalions, mainly to draw guard duty on islands that had already been secured. After islands were fully under control of American forces, the 51st Battalion saw duty in Ellice and Mariana Islands, while the 52nd Battalion was stationed on the Marshall Islands and Guam. Both the 51st and 52nd acted as replacements of white units to support invasions. Over time after proving their mettle, the 51st Battalion came to be known as the best gunners in the Marine Corps. The Montford Pointers who actually saw the most combat on the war's bloodiest beaches, from Iwo Jima and Okinawa to Peleliu and Saipan, were those who had the least combat training. The ammunition and depot companies, who were meant to see that frontline troops could keep advancing by stocking ammunition and supplies, became expert combat fighters and riflemen in the fire of battle. These Marines also acted as stretcher bearers, removing the wounded and dead from the frontlines. The nine black Marines killed and 78 wounded in action during World War II were not even supposed to have had contact with the Japanese. The performance of these black troops in World War II helped other military personnel see what the men of Montford Point already knew: That they were more than able to perform as equals to those white Marines trained at other locations. The Montford Point Marines' great performance in the Pacific during the war did not win them recognition or full acceptance, though. The Corps was required to retain some black Marines, but they reduced their percentage within ranks and continued segregation. Their postwar force of 100,000 planned to have no more than 2,800 blacks. This number was further reduced to less than 1,500 in 1947, with all graduates segregated in general duty units. A plan was developed in late 1947 that one-third of the 1,388 African Americans in Marine Corps would be serving in the Stewards Branch. Montford Point was kept as a segregated training facility for black service units, along with the Marine Corps Barracks in New Jersey, Pennsylvania, and Hawaii. Finally in 1948, President Harry Truman signed Executive Order 9981, which moved to abandon segregation as a federal policy and required desegregation of the entire military. Almost one million African Americans served in World War II, which showed the nation firsthand the dedication and loyalty of a group being so discriminated against. The nation's public was appalled by the horrors heard of the Holocaust, making them more receptive to end the systematic discrimination happening in their own nation. The Marine Corps was slow to carry out integration orders, but they deactivated Montford Point as a segregated training facility in September of 1949 and started sending black Recruits to training at Parris Island and San Diego. 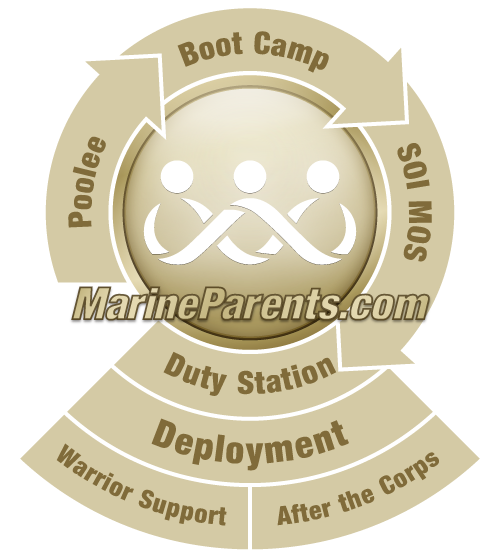 The split command had produced over 20,000 new Marines over the years at Montford Point. The Korean War marked a turning point, and the Marine Corps quickly and fully integrated in June of 1950. It is said that the troops were much more concerned with staying alive than concentrating on the color of others in their outfits. Montford Point Marines were important in all major campaigns of Korea, from serving as frontline troops, to being involved with service and supply units. Less than a decade later, these Marines played an integral part in helping stop the spread of communism through the Vietnam War. Most Montford Point Marines had left the Corps by this point, including those who had served 20 years, but many fought on the frontline and with support units, taking action in some of the most memorable campaigns like the Siege of Khe Sahn and the Tet Offensive. These brave men helped spread liberty and end the political disruption around the globe. By the end of these conflicts, the Marine Corps was very changed from what it had been at the start of Montford Point. The Corps' ranks were fully integrated and a large majority of those who served in Vietnam had never experienced segregation. Historic events like the 1963 March on Washington to fight white supremacy, along with the 1964 Civil Rights Act, helped segregation as a legal system die and encouraged the integration efforts of the military into the future. The men of Montford Point joined the Marines for a normal variety of reasons. Some were enamored by the Marine reputation of being the ultimate fighting force, while others loved the allure of adventure. Still others were interested in the "romance" of serving and impressing the ladies in their dress blues. Many joined to escape poverty, gain employment, and most of all, rise above discrimination. While their reasons for becoming Marines varied, their missions and valor over the years helped end the segregation crippling the nation, and ensure liberty and equality for all Americans, regardless of color or creed. Today, the Montford Point Marines Museum is located in one of the original buildings on the grounds of Camp Montford Point, now called Camp Johnson, at Camp Lejeune in North Carolina. Buckley, Gail Lumet. American Patriots: The Story of Blacks in the Military from the Revolution to Desert Storm. New York: Random House, 2001. "History." Web. 23 Jan. 2012. www.montfordpointmarines.com. Latty, Yvonne, and Ron Tarver. We Were There: Voices of African American Veterans from World War II to the War in Iraq. New York: Amistad, 2004. McLaurin, Melton Alonza. The Marines of Montford Point: America's First Black Marines. Chapel Hill: University of North Carolina, 2007.